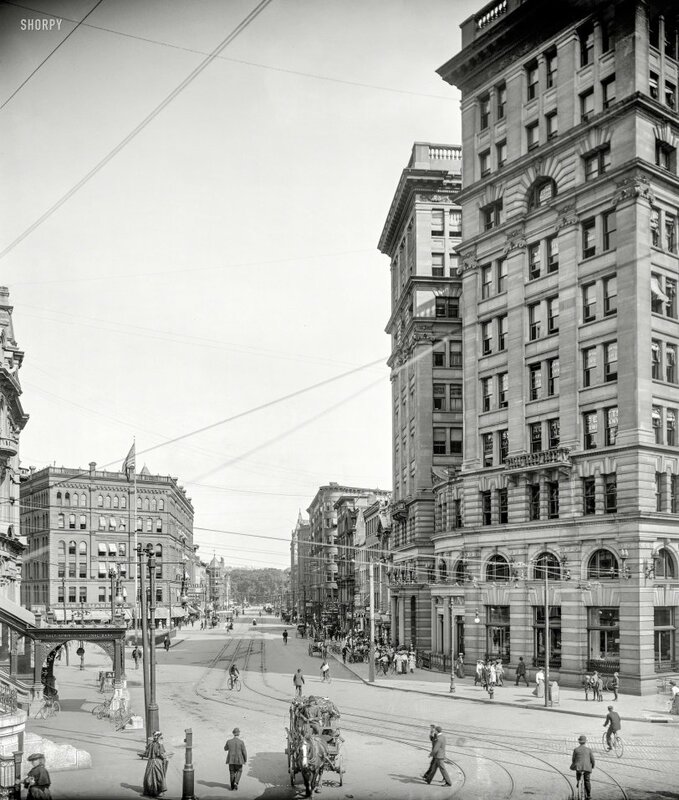 Syracuse, New York, circa 1904. "Genesee Street." Early-1900s standbys include the usual assortment of painless dentists, and a "Misfit" clothing parlor. 8x10 inch dry plate glass negative, Detroit Publishing Company. View full size. Submitted by karinagw on Mon, 07/07/2014 - 1:49pm. It's hard to see, but this is pretty much where the image was taken. If you go straight down the tree-lined path, almost all of the buildings on the right hand side seem to be there (actually the Salt Springs Bank on the close left is also still there without its pretty entry). When we were 21 ? Submitted by Dbell on Wed, 06/25/2014 - 3:51pm. An early film, perhaps? There was to be one in 1921, but I couldn't find anything earlier. Submitted by fanhead on Wed, 06/25/2014 - 3:33pm. Apparently the bank wasted their money on the bike racks. They don't seem to be very popular. Submitted by mxs on Wed, 06/25/2014 - 1:46pm. 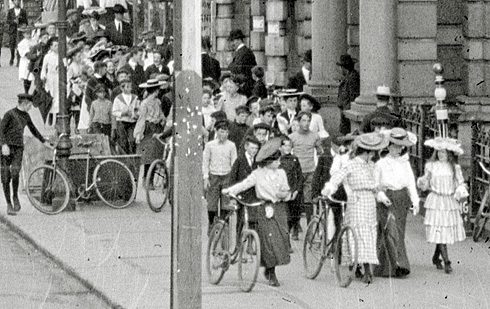 Has to be the most bike friendly city in the early 1900's. You've posted many street scenes from numerous cities, but I can't recall any with so many bicycles. Submitted by OTY on Wed, 06/25/2014 - 1:45pm. Oddly enough, the majority of the people are clustered around Meyer's Misfits which perhaps would indicate they didn't have a very high opinion of themselves. (Wonder if Marilyn Monroe got her wardrobe there for her movie of the same name).